S - "Power": 2 small filler each with 7 kg max. M - "Strength": 2 big fillers each with 18 kg max. L - "Large": 3 big filler each with 18 kg max. The Ultimate Sandbag is made of a hard-wearing training bag, which can be equipped with several fillable sand bags. The fitness device is excellent for functional strength training, i.e., to strengthen joint-stabilizing muscles. The Ultimate Sandbag body has 5 handles and 2 end straps (2 handles for the Power-Sandbag), offering many varied training varieties. Though functional strength training with the Ultimate Sandbag is much different from common workouts with barbells/dumbbells, even beginners can exercise with the weighted bag. The Ultimate Sandbag is available in several weight classes. We recommend to fill additionally the Ultimate Sandbag with rice instead of sand for beginners of Functional Training. Delivery of the Ultimate Sandbag includes a workout dvd offering a quick and easy start of functional strength training. 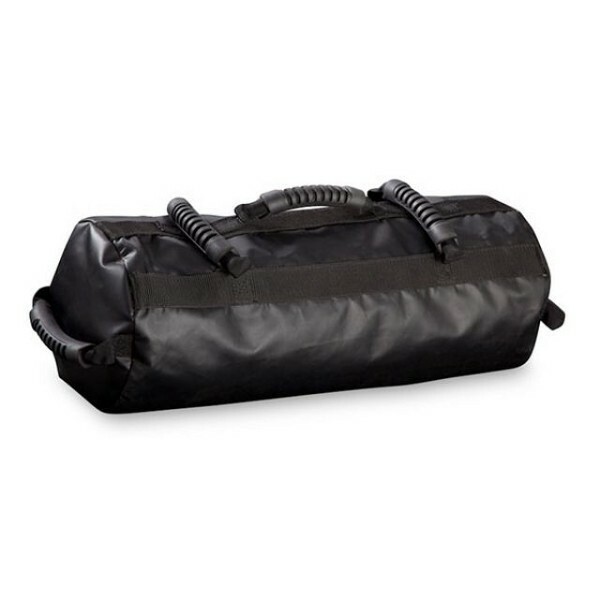 The weighted bag is very sturdy and has a long lifespan for appropriate use.